This work was originally exhibited as part of a larger concept show consisting of 5 works entitled, of surf, death, tropes and tableaux: The Psychedelic Gedankenexperiment. Isolation Tank is a single channel HD video projection and is entirely computer generated (the sound has been generated with an analog audio synthesizer). At first we see a surfboard from afar seemingly drifting in the middle of the ocean. The camera (unseen helicopter) slowly approaches the object until it fills a good portion of the screen. On the surface of the board can be seen a kind of decal. A closer look reveals an almost imperceptible morphing between a visage (perhaps a representation of the artist's face?) and the image of a Mahakala (a protector of Dharma in Tibetan Buddhism usually depicted with a crown of five skulls representing the transmutation of the five kleshas, or negative afflictions, into the five wisdoms. Also and importantly it represents the death of the ego). 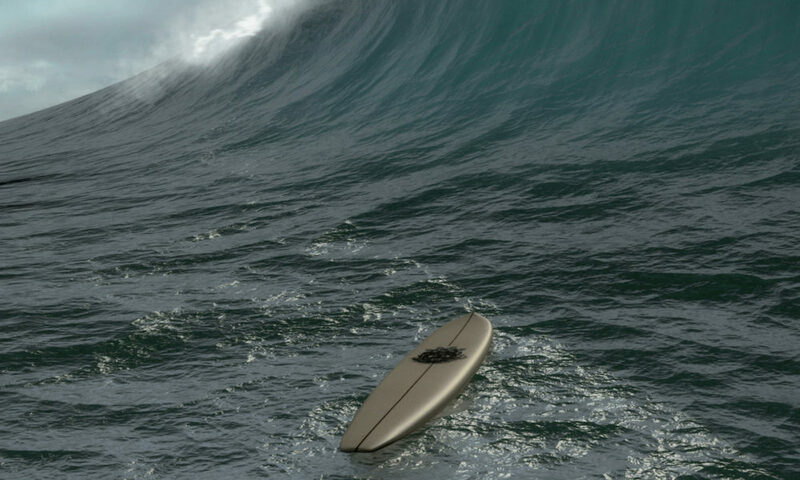 As the sound of the helicopter becomes audible, a rogue wave from nowhere jacks up and throws a wall of water over the surfboard pushing it under water. In a kind of point of view (POV) swap the helicopter sounds as if it has gone under water and then reemerges as the board pops up. 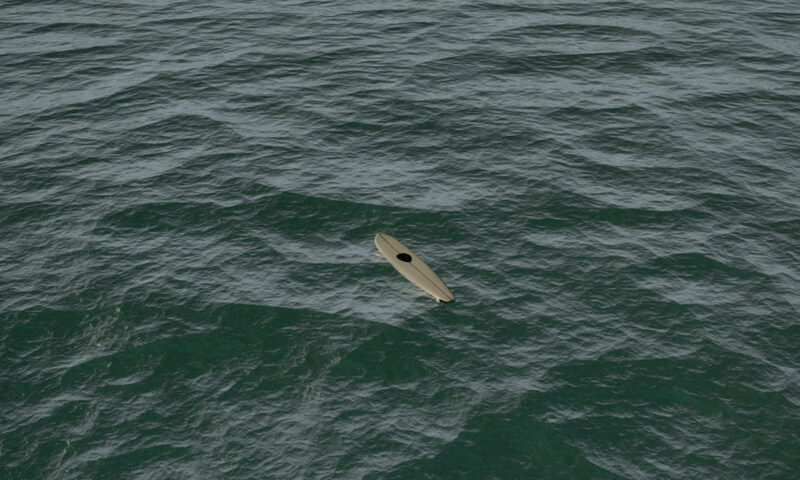 The camera/helicopter pulls back and hovers above the scene rippling the surface of the water around the surfboard before returning to the opening vantage point and then loops again. In the complete work the loop is seamless. “of surf, death, tropes & tableaux: The Psychedelic Gedankenexperiment,” Gladstone Gallery, New York, NY, March 18 – April 23, 2011. "Gary Hill: Glossodelic Attractors," Henry Art Gallery, Seattle, March 31 - September 16, 2012. 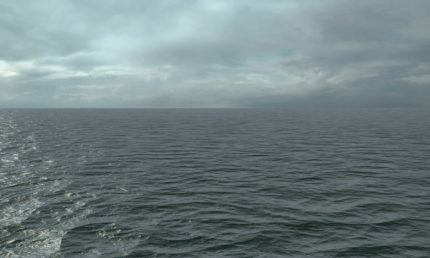 “Up Against Down,” DNA Galerie, Berlin, Germany, April 27 – June 30, 2012. “Augment This (Meditations on the Image,” Cherry and Martin Gallery, Los Angeles, July 12 - September 13, 2014. 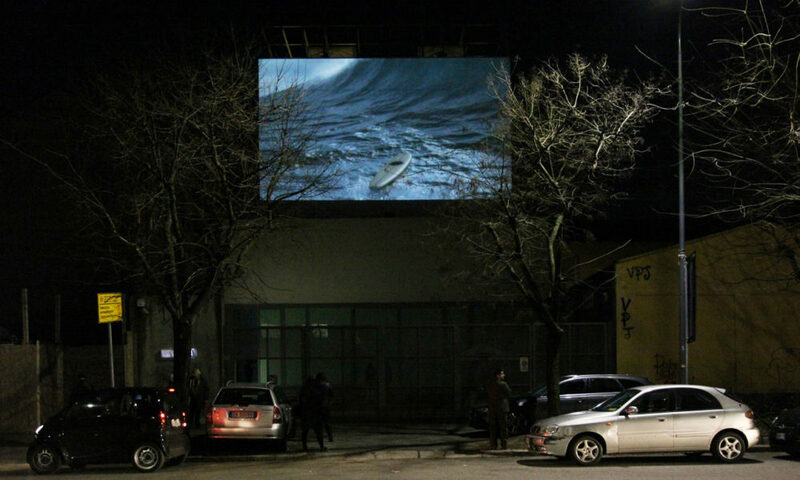 “Depth Charge,” Lia Rumma Gallery, Milan, Italy, February 26 - April 22, 2015.